It depends on whether your system is using your WiFi network or a dedicated Sonos network. When Sonos is operating on WiFi, the range extends to the range of your WiFi network. As long as your WiFi reaches all the rooms where you want to put a Sonos product, you won't have any issues with range. If your WiFi network isn't reliable, or doesn't reach all the areas where you want to use Sonos, connecting a Sonos product to your router with an Ethernet cable automatically creates a dedicated Sonos wireless network. Each Sonos product you use in your home serves as a wireless repeater to expand the range of our dedicated network. Bluetooth is a short-range wireless solution that works by pairing a Bluetooth speaker to a smart device to access music. Because your smart device and speaker need to be physically close to each other, the wireless range, expandability and control of a Bluetooth connection can be limited. Sonos speakers connect to one another using the WiFi network in your home. WiFi has greater range and works with multiple devices, which means you can use Sonos to send different music to different speakers at the same time, or the same song (in sync) to all your speakers at once. WiFi also allows you to control any Sonos speaker using the Sonos app on any computer, smartphone or tablet on your network. 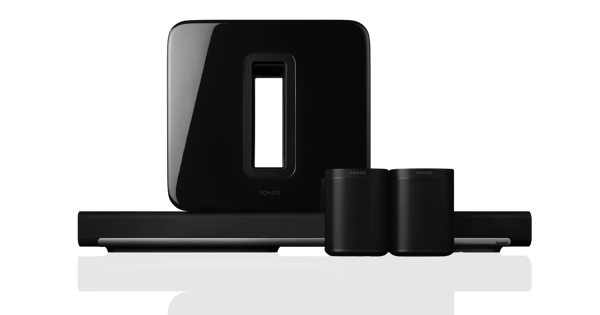 To compare Sonos and Bluetooth, visit Sonos vs. Bluetooth. Yes, with Playbase or Playbar. Just connect it to your TV using the optical cord that comes with it. Then control it with your regular TV remote, or with your mobile phone or tablet using the free Sonos app. Playbase and Playbar also work as music streaming speakers when your TV is off. On the Sonos app you will see an option in the Main Menu for "This Device". This is where you will find the music files and playlists stored on the mobile device. If you have a Playbase or Playbar hooked up to your TV, it can send TV audio wirelessly to any Sonos unit in your system. Smartphones, tablets, and computers can all control Sonos using our app. 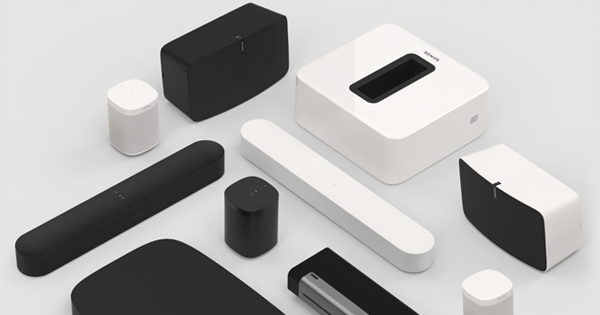 These devices can also store music for Sonos to play. If you turn off a device which is storing the music that Sonos is playing, the music will stop. On the other hand, if you're controlling Sonos from your phone and playing music from the Internet or your computer, turning off your phone won't stop the music. It's just like putting away your TV remote while the TV is on. 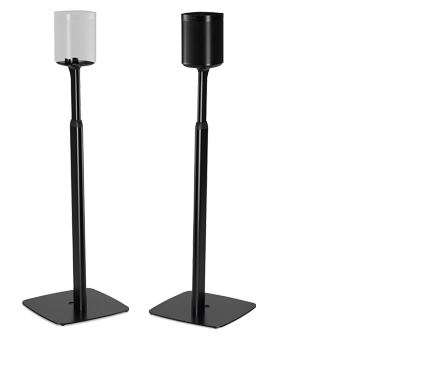 The speaker units that we sell, the Play:1, Play:3 and Play:5, are not weather-rated, but they are durable. They can certainly be moved outside, but they’re not designed to live there long term. As long as you’ve got a power outlet and WiFi, you've got Sonos. If you’re looking for a permanent outdoor zone of music, you can use our Connect:Amp unit with traditional weather-rated speakers. The Play:1 and Play:3 each have a 6.35 mm. / 20-threaded mounting socket on the back. You can use any speaker mount with a 6,35 mm. / 20-threaded insert. Just make sure the mount is designed to support the weight of your speaker. Play:1 weighs in at 1.85 kg. ; Play:3’s a slightly heftier 2.59 kg.